Recorded live during the fifteenth Vision Festival in June of 2010, this group features Rob Brown on alto saxophone, Matt Moran on vibraphone, Chris Lightcap on bass and Gerald Cleaver on drums. They achieve a nice, fresh and appealing free-bop feel, akin to the open ended music recorded by Blue Note Records in the mid 1960's. Opening with "Kite," the music has a fast pace with tart alto saxophone and open accents from the vibes. A nice, fresh sounding vibraphone-bass-drums section is anchored by Lightcap's throbbing bass which eventually steps out for a solo backed by light percussion. "Wonder/Wander Off" has a slower, open feel with bass and drums and subtle saxophone and vibes accents. Spare and restrained, this music has a patient, unhurried and mysterious feel. "Tic Tic" shifts to a well controlled uptempo, with Brown's fast and angular saxophone framed by vibes, giving the music a feeling reminiscent of Eric Dolphy's classic Out To Lunch LP. A rapidly percussive vibraphone solo leads to a drum feature that keeps the pace moving. Bowed bass and light percussion usher in "Lurking/Looking" which slowly builds to a gently melodic improvisation. 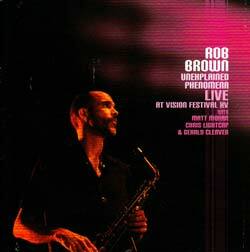 Alto sax and vibes are featured with an undercurrent of deeply tidal bass. Brown slowly ups the ante with over blown accents to create an air of unease. "Bell Tone" wraps up the set over the rapid throb of bass and drums. Angular saxophone and vibes recall the dynamic Sam Rivers and Jackie McLean had with Bobby Hutcherson, with a sense of the mid 60's free-bop brought into the 21st Century. Sax and drums build in potency to a fine conclusion of an exciting album.